Heat oven to 350°F (325°F for dark or nonstick pans). Place paper baking cup in each of 24 regular-size muffin cups. Make cake mix as directed on box for 24 cupcakes. Divide batter evenly among muffin cups (about two-thirds full). Bake 14 to 19 minutes or until toothpick inserted in centre comes out clean. Cool in pans 10 minutes; remove from pans to cooling rack. Cool completely, about 30 minutes. In small bowl, place vanilla frosting; tint with orange food colour to desired colour. Frost each cupcake with 1 generous tablespoon orange frosting. Cut licorice twists into 24 equal pieces. Press licorice into top edge of each cupcake for stem. Spoon chocolate frosting into small resealable food-storage plastic bag; partially seal bag. Cut off tiny corner of bag. Squeeze bag to pipe different faces, and decorate with candy eyeballs (use photo as guide). Use a decorating bag fitted with small plain piping tip when using the chocolate frosting for a more polished decorating look. No green licorice pieces? Pretzel sticks make a great alternative! 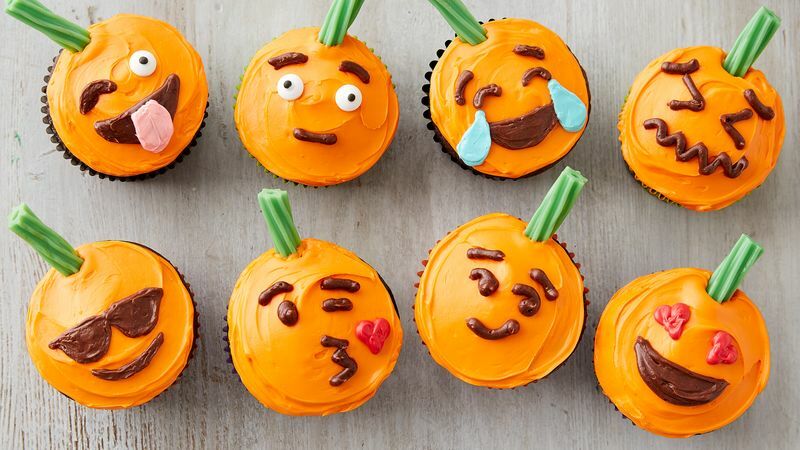 For colourful emotions, tint additional frosting with food colours and pipe on cupcakes.